Wildlife experts believe a coyote attack may be responsible for the death of a dog in Annandale, Virginia, and homeowners are being warned to take "responsible" precautions. WASHINGTON — Wildlife experts believe a coyote attack may be responsible for the death of a dog in Annandale, Virginia, and homeowners are being warned to take “responsible” precautions. A small Maltese dog named Rufus was killed overnight Sunday in the backyard of a home on Bradley Circle which is near Holmes Run Stream Valley Park. A Virginia wildlife biologist told WTOP the homeowner reported seeing an animal fitting the description of a coyote before and after the dog’s remains were found just outside the yard. 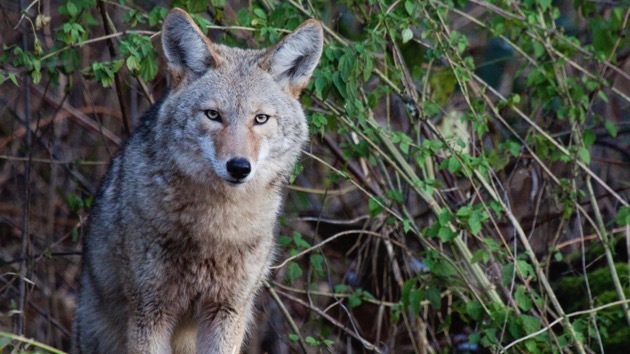 “Coyotes do prey on small animals, so small dogs or cats would fit the bill for them to be potential prey animals,” said Kevin R. Rose of the Virginia Department of Game and Inland Fisheries. “If you have cats, it’s best to keep them indoors for their own protection. Small dogs should be supervised when they’re outside,” Rose cautioned. Coyotes are very secretive, typically active at night and good at escaping the notice of humans unless they’re searching for food sources. To avoid attracting coyotes, Rose advised homeowners to secure trash and dirty grills, don’t store pet food outside and bring in bird feeders at night so they don’t draw rodents coyotes like to eat. Coyotes also will eat bird seed along with fruit, garden vegetables and compost materials. “We need to be responsible about how we interact with them — not having food attractants or habitat that they’re going to be attracted to on our property,” Rose said. If you see coyotes, Rose said it’s best to try to scare them away and let them know they’re not welcome. “Just reinforce that natural fear of humans they have, so we can coexist,” Rose added. Coyotes inhabit every state in America. Both Maryland and Virginia have nuisance wildlife helplines if you have questions or need advice.